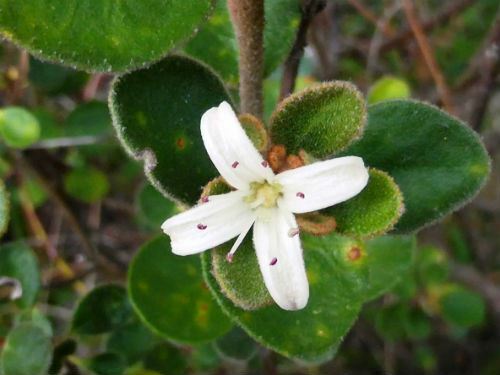 Correa alba is a rounded, dense shrub that may reach a height of three metres. In our cold climate garden specimens reach a height of about two metres. Leaves are almost circular, greyish-green with a rounded end. The flowers are not typical tubular Correa flowers. Correa alba has blooms that are more flattened and star-shaped. They are usually white with some forms having blooms with a pink tinge. The main flowering period covers autumn and winter with sporadic flowering at other times. Correa alba has a wide coastal distribution and occurs in NSW, Victoria, Tasmania and South Australia. Our specimens have proved to hardy, free flowering, frost and drought resistant. One plant is growing on the south side of our house and during winter is in complete shade for almost three months. In other words, this species is ideal for very shady areas. Correa alba has an interesting botanical history. The species was originally collected in Port Jackson probably by Sir Joseph Banks who sent seeds to a London nursery. They raised plants in 1793. A description and illustration (see thumbnail) appeared in The Botanist’s Repository foe New and Rare Plants published in 1798. 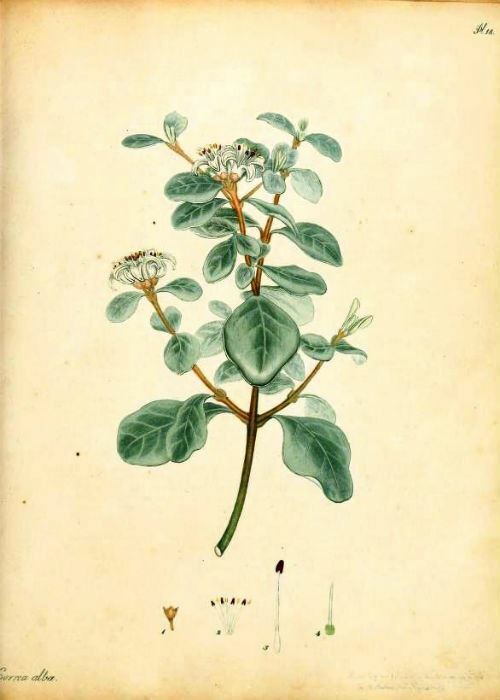 Another Correa alba illustration appeared in The Botanical Cabinet published by another London nursery in 1818.